Excellent choice to spin-out the rare full five, Pete! There was no way this one could get any less then a full five! It is a movie I watched way too many times over the years... so much so I could almost speak the lines with several of the characters. But even with watching it that often it still has me glued to my seat watching it. That alone says a lot! I just glanced over my list of what I watched so far this year... out of 72 movies watched I only gave a full five to two movies. This one and Deliverance. 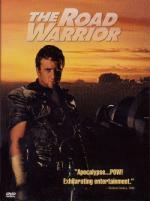 I am thinking about watching The Road Warrior sometime today. I have seen all 3 Mad Max movies... but not in many years. Not since I was a teen. So I really don't remember anything at all about the storyline. So my question is... Should I wait and see Mad Max again first before attempting to watch The Road Warrior again? Storyline wise... will I be confused if I go straight to The Road Warrior? Not at all. The little you need to know (some basic background about Max) will be given to you in a flashback (although it's rather sketchy) and other than that it's very standalone, mainly building on the character, not the previous film. Heck, I personally always thought they are almost disconnected, with the world being way more destroyed in the second one than it was in the first one. Thanks guys! I will do my best to get to The Road Warrior later today! In the annals of action movies few can compare with The Road Warrior, a full-throttle epic of speed and carnage that rockets you into a dreamlike landscape where the post-nuclear future meets the mythological past. More simply, it's also one of the most mind-blowing stunt movies ever made. Before he took aim in three Lethal Weapons and starred in 1994's Maverick, Mel Gibson had already made his mark on movie history as Max, the heroic loner who drives the roads of outback Australia in an unending search for gasoline. Arrayed against him and the other scraggly defenders of a fuel-depot encampment are the bizarre warriors commanded by The Humungus, notorious for never taking prisoners when they can pulverize them instead. When the battle is joined, the results are savage, spectacular and "a smashing good time at the movies" (Sheila Benson, Los Angeles Times). With The Road Warrior on your side, screen action doesn't get any better. I know I have seen this movie back when it was first released. But going into it today... the only thing I remember about it is that I enjoyed it. What little I remembered I was right about. This is a good movie... though not something I see myself being able to watch very often. But I would like to at the very least get Mad Max in my collection to go with it. The DVD itself is a decent release. It has both the widescreen and Fullscreen versions of the movie on a double sided disc. It really don't have that much for extras. But I definitely can't complain. It is a good movie with a standard DVD release. BTW... it is one that I got for free when our good friend Achim sent it to me in a DVD Care Package. Thanks Again Achim! Now I just wish I had the other Mad Max movies to watch today! The only one you've reviewed so far this weekend that I have seen is The Silence of the Lambs and it's a rare film that I have two editions of, both the Criterion and the MGM special edition. I got the Criterion first, I think, though I'm not sure. I actually like the one with more vibrant colors but I like having both editions since Jodie and Anthony do commentary on the Criterion edition. I haven't seen this in awhile. I should pull it out soon and watch it with the commentary which I've not really given a complete listen to yet. Martin Riggs (Mel Gibson) is no ordinary cop. He's a Mad Max gone maniacal, a man whose killing expertise and suicidal recklessness make him a Lethal Weapon to anyone he works against. Or with. Roger Murtaugh (Danny Glover) is an easygoing homicide detective with a loving family, a big house and a pension he doesn't want to lose. Imagine Murtaugh's shock when he learns his new partner is a guy with nothing left to lose: wild-eyed, burnt-out Martin Riggs. Lethal Weapon is the thrill-packed story of two Vietnam-vets-turned-cops who have just one other thing in common: both hate to work with partners. But their partnership becomes the key to survival when a routine murder investigation leads to all-out, take-no-prisoners, martial-arts-and-machine-guns war with an international heroin ring. Director Richard Donner (Superman: The Movie, The Goonies) moves that war at two speeds: fast and faster. Hot L.A. days and nights explode in one show-topping scene after another, culminating in a no-holds-barred battle between Riggs and his Angel-of-Death nemesis (Gary Busey) - an electrifying sequence incorporating three martial arts styles and requiring four full nights to film. Fierce, fast and frequently funny, Lethal Weapon fires off round after round of can't-miss entertainment. After watching The Road Warrior I just couldn't help myself but to watch some (at least 1) titles from my favorite movie franchise to star Mel Gibson. 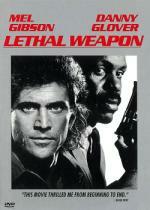 Lethal Weapon has to be among the best (if not THE BEST) of buddy cop movies. Mel Gibson teamed up with Danny Glover seems like the perfect team. Not only is it action packed... but there is a few laughs thrown in for good measures as well. I got a kick out of one thing they did or I should say where they goofed. When Riggs was showing off his shooting skills... Murtaugh shoots one shot at the target... a perfectly centered head shot. Riggs makes the target go far away... and right before he shot I thought to myself... I wonder... I count as Riggs shoots 6 shots. Sure enough... when he brings the target back... there was 7 NEW holes in the target (Murtaugh = 1 [nose]... Riggs shoots 6 but there is 2 for eyes and 5 for mouth = 7). I really enjoyed every minute of the movie. I especially liked the end fight. Sure... they already had him... not realistic that they would have the fight. But that didn't make it any less fun. Highly recommend this (the entire franchise) if you never seen it! 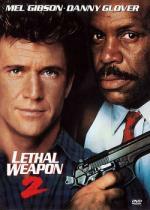 Buddy-cops Martin Riggs and Murtaugh are back, trying to keep a key witness (Academy Award® winner Joe Pesci) – and themselves – alive in Lethal Weapon 2. Murtaugh is still the rock-solid family man. Riggs is still the reckless daredevil, but now he counts his odds before bucking them. He cracks more jokes too. "I thought in this film I could take Riggs in a slightly different direction and maybe have some fun," Gibson says. Fun it is. And exciting, from its breathless, opening chase through L.A. streets to its raging gun-battle finale. In between, there's a six-story plummet from a window, a booby-trapped toilet, a Houdini-like underwater escape and the incredible destruction of a chic hillside stilt house. "With Mel and Danny, Joe is the third stooge," director Richard Donner says. That makes three drop-dead funny guys. And one of them is lethal. After watching the first one earlier I felt like watching the second one as well. And I must say... they really amped up the comedy in this one. I found myself literally laughing out loud off and on through-out the entire movie. But just because there is more comedy don't mean it lacks in action. I liked the blonde girl that Riggs hooks up with in this one. I normally don't go for blondes but she was right cute. She was played by Patsy Kensit... not really that familiar with her. Though I do have a couple other things with her in it. Only problem with this one. I don't know... it seemed like a bit of a let down on how it ended. The ending of the first one was more exciting then this one. But this one is still definitely worth watching... Enjoyed it very much! I normally don't go for blondes but she was right cute. She was played by Patsy Kensit... not really that familiar with her. Though I do have a couple other things with her in it. She's a British actress and Lethal Weapon 2 was her only real attempt to get a movie career. In recent years she's become a proper TV actress, first in soap Emmerdale and now in Holby City. Playing a nurse. That's right, Pete. A cute blonde in a nurses uniform! I remember (although I was a teenager then and watching this kind of movies was fairly new to me) seeing this film 4 or 5 times within 36 hours I still like it a lot now; it's a great action flick with just enough character stuff to keep things interesting on that end. (The first film is basically the other way around, you get more character stuff before the action kicks in near the end; except that awesome chase scene in the beginning of course. That would work for me! The only other things I have her in (according to DVDP) is Full Eclipse, Kill Cruise (which I still haven't watched) and an episode of Tales from the Crypt.